I always savor the irony of a Civil War-era “outsider,” whether a soldier or a civilian, a writer, sketch-artist, or photographer, creating what turns out to be the most detailed of all the known portrayals of a building destined to vanish from the landscape. The war was extraordinary in part for bringing national and enduring fame—even international renown—to countless, ordinary sites and structures that would otherwise have received little if any notice, even on the local level. In peacetime such places gained, at most, only fragmentary documentation in census- and legal records, insurance policies, or the occasional notice in a diary or newspaper. The events of 1861-1865, however, brought scrutiny by strangers with fresh eyes, sharpened still more by the awareness that a particular building could mark the boundary between life and death, or even success and failure of national import. And a further irony presents itself: the very Civil War events that brought the attentions of strangers and their heightened sensitivity often destroyed the places they documented vividly…soon after that documenting was achieved. 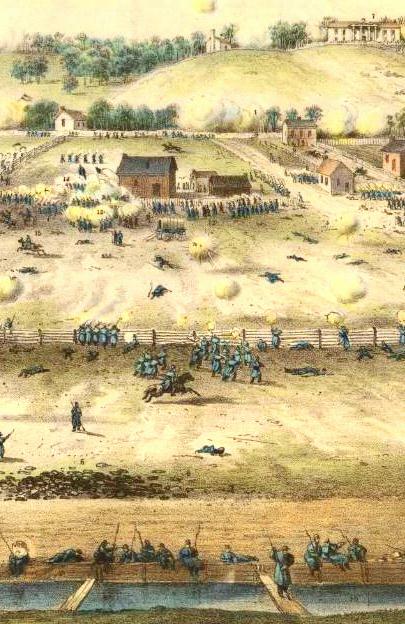 Working from John Keyser’s eyewitness, black-and-white sketch, a Philadelphia lithographer produced a vivid, color depiction of Stratton’s Wheelwright Shop complex—the large building with dark roof at upper center in this detail from “Charge of Kimball’s Brigade in the Battle of Fredericksburg.” Yet a comparison with the sketch and other contemporary pictures discussed below reveals major distortions in the color version. 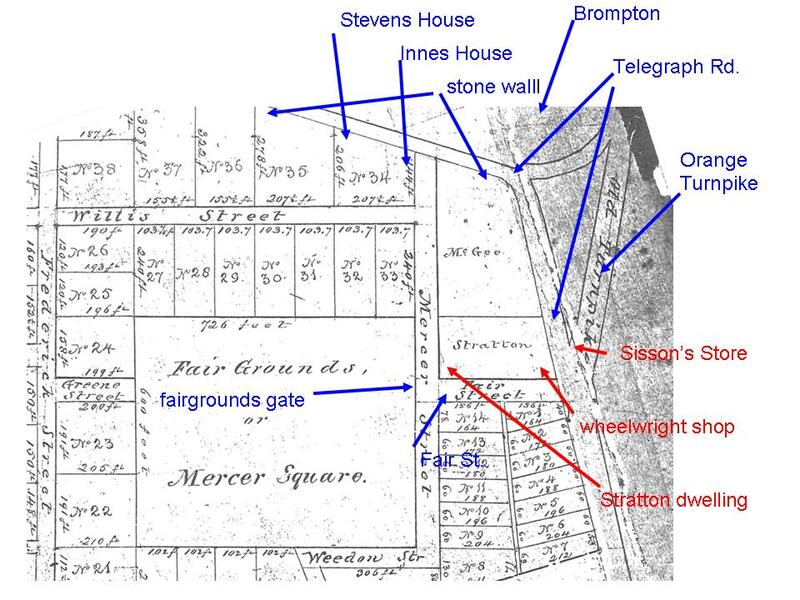 (Note Brompton at upper right and the millrace at bottom for orientation.) Courtesy Anne S. K. Brown Military Collection, Brown University. Such was the case with Allen Stratton’s wheelwright shop, situated on what in December 1862 became the Bloody Plain at the outskirts of Fredericksburg. 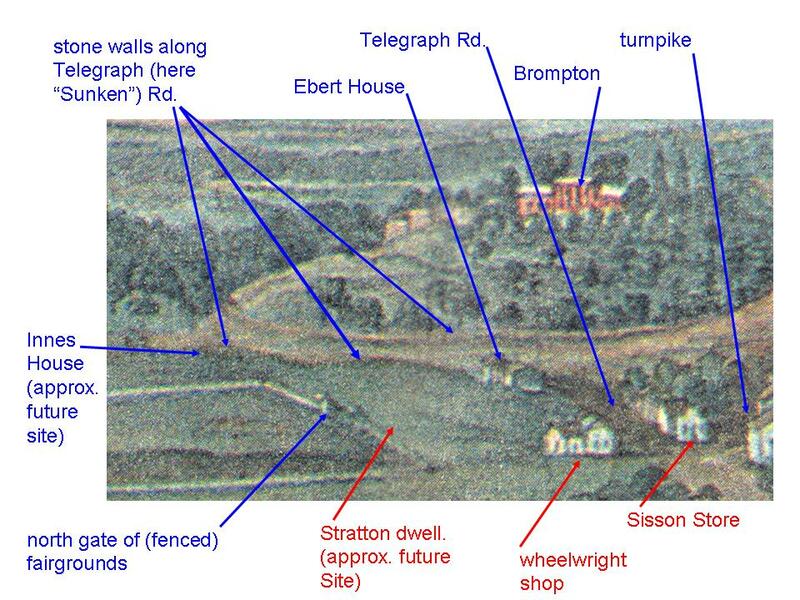 Stratton’s enterprise consisted of two principal, wooden structures likely housing a blacksmith’s forge, a carpentry shop, and a stable/storage area, and perhaps linked together by a smaller connector-structure. (I will refer to the shop in the singular for the purposes of this discussion.) Of these two principal components, one fronted Fair Street, and one fronted both Fair and a stretch of Telegraph Road also known as the “Court House Road” (modern-day Kirkland Street in that vicinity) opposite Sisson’s Grocery Store. 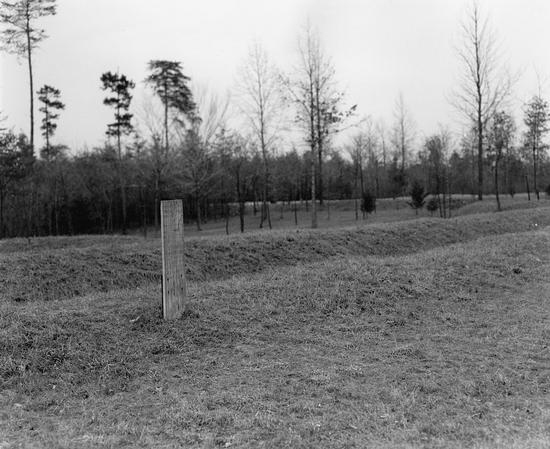 Confederate trenches on the east face of the salient at Spotsylvania, in the 1930s. The wooden marker indicates where Confederate general Allegheny Johnson was captured. It seemed like a good idea at the time–the government would own only tiny slivers of land, while the ever-present farmers would perpetually manage all else. The underlying assumption: the farmers would be here always–the land preserved in partnership, the vistas always accessible to visitors. In 1927, the year Fredericksburg and Spotsylvania NMP was created, it seemed like a reasonable approach. But, that assumption, made nearly 84 years ago, has dominated the management and evolution of the park ever since. The park in 1936. Click to enlarge. 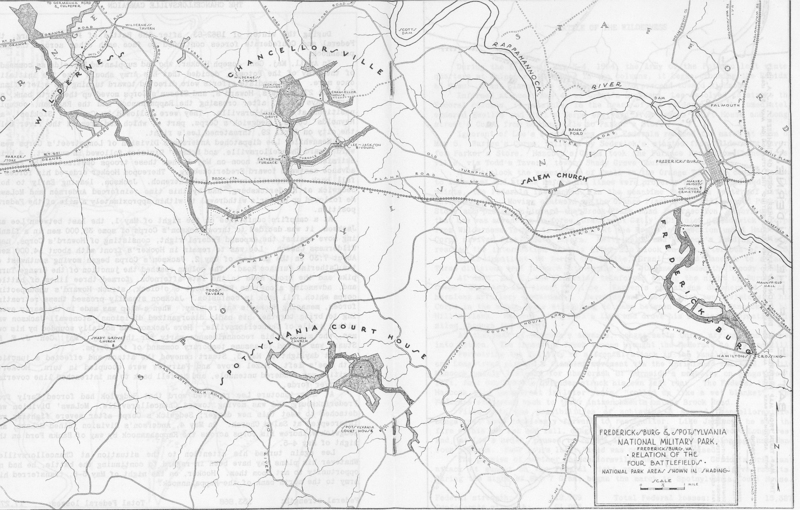 The original concept of the park focused almost entirely on the physical and visible remnants of battle–trench lines, house sites, and a few old road traces. 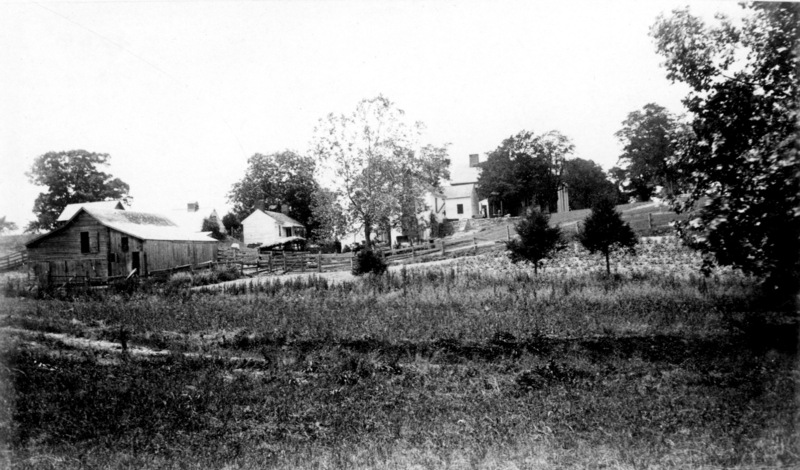 It was the embodiment of what was known as the “Antietam Plan.” With two notable exceptions, the park consisted entirely of historic roads and earthworks, or earthworks with new roads built along them (e.g. Lee Drive at Fredericksburg). Rob Hedelt of the Free Lance-Star did a very nice article on our walk-around at Brompton, highlighting Frank O’Reilly’s excellent work. You can find it ﻿here﻿. I have posted some thoughts about the afternoon’s proceedings at the Baptist Church event over at ﻿Fredericksburg Remembered. ﻿Kevin Levin also offered up some thoughts over at Civil War Memory. Thanks to all of you who were able to attend. We’ll get a post or two up in our traditional vein before the Thanksgiving break…. Saturday is our inaugural Sesquicentennial event, which in fact helps explain the slow pace of posts on here this week. Bill Freehling will be speaking on Virginia’s tortuous descent to war, illuminating his book Showdown in Virginia. George Rable will speak on Secession and the Confederate nation. And I will treat secession as it played out in the Fredericksburg area. Bill and George are heavy hitters and great speakers. The speakers get going at 1 p.m. The event is in the historic Fredericksburg Baptist Church on Princess Anne Street. Registration is requested (famcc.org) but not required. We have well over 250 registered. Everything is free, except the books. They will be on sale throughout, and a book signing and reception will follow at the Fredericksburg Area Museum. The weather is supposed to be great, the Fredericksburg Area Museum has done a great job of organizing the event. We hope to see you. As we have mentioned here before, in the morning we will be doing a walk-around at Brompton, featuring Frank O’Reilly, Greg Mertz, Eric Mink, and me–each of us covering a different aspect of the place and its story. That starts at 10:30 and runs till noon. You can join in any time–we’ll be rotating people around the grounds from stop to stop. We’re very grateful to the University of Mary Washington and President Rick Hurley for giving all of us the chance to spend some time on the grounds of Brompton, the home of Fredericksburg and Spotsylvania’s delegate to the secession convention, John L. Marye. The walk around too is free. Just come along. In advance of that, I wanted to share a an image that has rarely been seen–a nice addition to our earlier post on Brompton. We present it here today courtesy of Jerry Brent, one of the premier collectors of things Fredericksburg, and, fortunately, incredibly generous in sharing his finds. It is an immediate postwar image taken from the ravine that borders Brompton to the South. 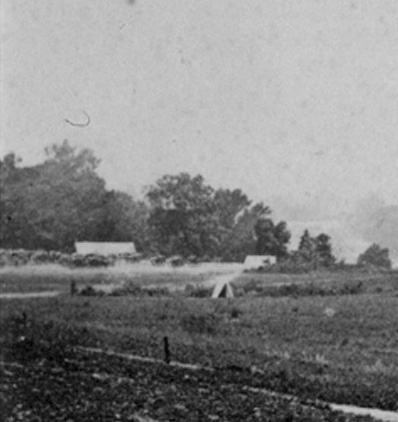 The camera is located almost directly across the Sunken Road from the Stephens house site, facing northwest. At the Second Battle of Fredericksburg on May 3, 1863, it was up the ravine in this view that men of the 6th Maine rushed after breaking through the paltry Confederate defenses in the formerly unassailable Sunken Road. The bullet holes that still mark the house and the outbuildings of Brompton are likely from the combat that attended this breakthrough. 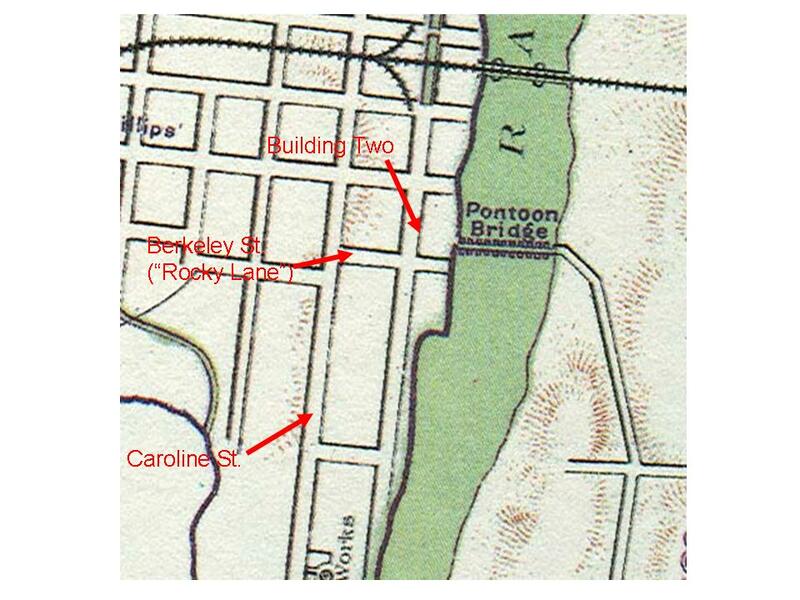 Finally Found: the Location of Waud’s Fredericksburg Pontoon-Laying Sketch? 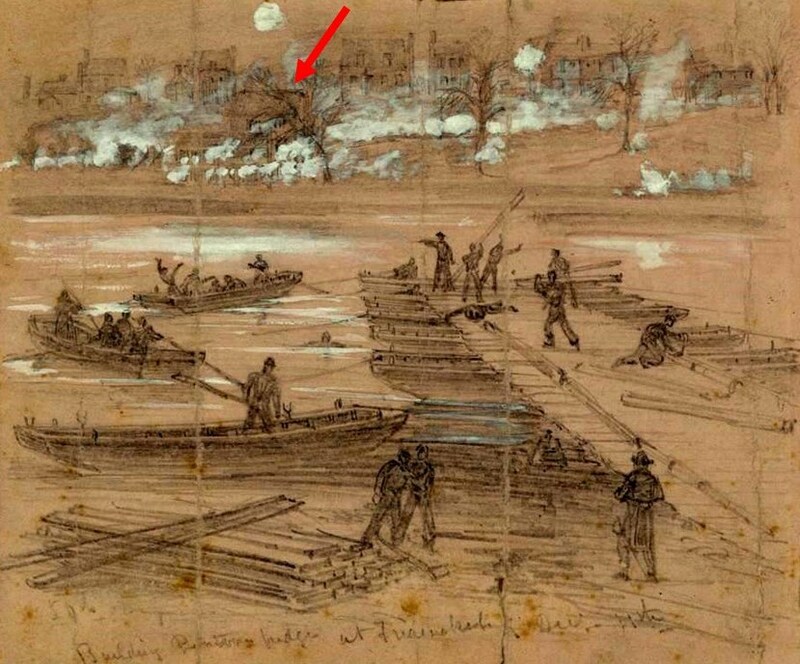 In a post about the Upper Pontoon Crossing, I discussed how an iconic Alfred Waud sketch of fighting along Fredericksburg’s riverfront, at a site never located definitively, could not be a depiction of combat at that crossing on December 11, 1862. I had been unable to document the existence of a particular building, shown in his sketch as advanced from its neighbors and sporting a lower component that extends to the left of a higher component, in known pictures of the Upper Crossing area, and in relation to the other structures appearing in his sketch. My post went on to speculate that the sketch was evidently not a depiction of the Middle Pontoon Crossing (a mile downstream from the Upper crossing), where Union engineers that same December day completed a 440-foot bridge. It connected a ferry-landing adjacent to the site of George Washington’s boyhood home, “Ferry Farm,” in Stafford County, to a point along the Fredericksburg wharves on the opposite side of the Rappahannock. So what, and where, was Waud sketching on December 11, 1862? Although I remain certain that his drawing does not depict the Upper Pontoon Crossing on December 11, I eventually found cause to rethink my doubting of the Middle Pontoon Crossing fighting that day as his subject. While examining the backgrounds of two panoramic, pre-battle pictures of the town as seen from the Stafford riverbank, I suddenly noticed in each of their middlegrounds what appears to be a striking match for Waud’s Building One…sharing the wharf area with Building Two. Unlike the photograph above, the perspective of both panoramas is wide enough to show the southern third of the wharf area. 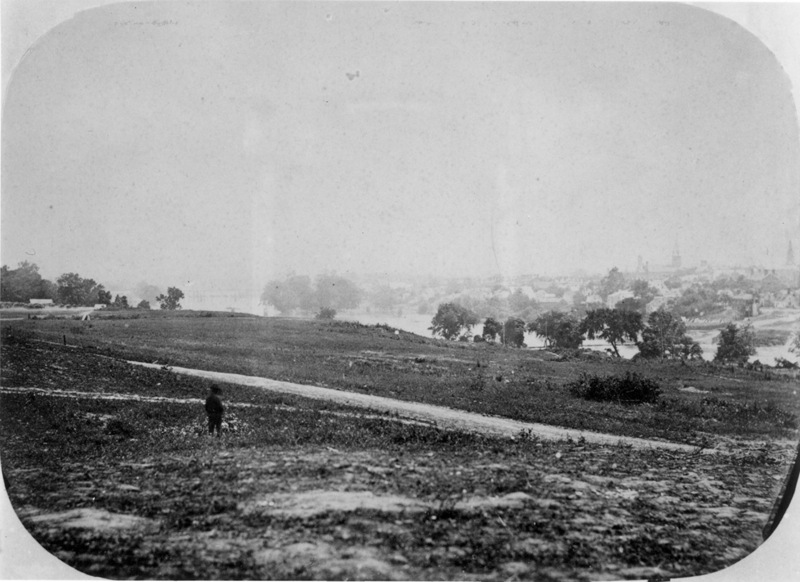 The earliest photograph of Fredericksburg? Noel Harrison used this image in his exploration of the upper pontoon crossing, and Eric Mink has looked at it and others taken about the same time in a Military Images article in 1998 (I hope he will expand on that work here sometime soon), but I do want to point out a few notable things about this image, taken in July 1862. 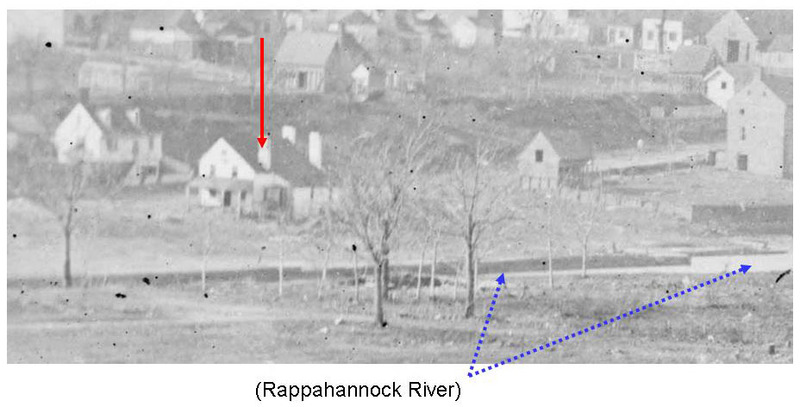 Given all the images that followed, this distinction is hardly dramatic, but it’s worth noting that this is likely the earliest known photograph ever taken of Fredericksburg. The photographer, unfortunately, seemed more interested in the foreground of Stafford Heights than the river and town beyond. Still, from his vantage point in what is today Pratt Park—north of the maintenance building—the steeple of the Baptist Church and St. George’s are visible, as is the cupola of the courthouse. The openness of the landscape is in sharp contrast to the heavy woods that border the river today. On the extreme left of the image is an artillery park adjacent to the woods that mark what we call the north ravine—the ravine just north of Chatham, which sits behind the trees on the left edge of the picture. The road running through the foreground leads to Chatham. While it’s not always important, it is unfailingly interesting when a newly found historical narrative confirms or elaborates on the content of a familiar historic image, or when an image emerges that gives vision to a long-known narrative. 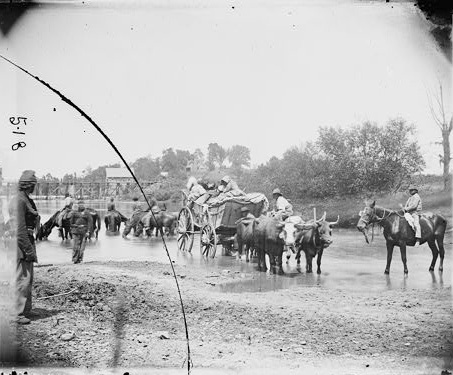 Recall, if you will, our post on the images of slaves crossing the Rappahannock River at Tinpot Ford (above), just downstream from Rappahannock Bridge on August 19, 1862. One of the park’s fine interns, Edward Alexander, sent along an item today that he turned up while digging through some Union regimentals. It is from Theodore Gates’s The Ulster Guard in the War of the Rebellion, page 241. The 20th New York State Militia crossed at Rappahannock Bridge and Tinpot Ford on the morning of the following day, August 20, and Colonel Gates offers witness to the passage of fugitive slaves across Tinpot Ford. While Gates and his regiment crossed the day after the photograph was taken, it’s hard not to imagine that Gates might have been describing the very family that appears in the O’Sullivan photograph (see the earlier post for details from that image). The details are uncannily similar in many respects. A great many negroes accompanied the Union army in its retreat, and some of them manifested the most extravagant and ludicrous joy when they got across the river. One party of them approached the ford a few rods below the bridge, where the water was two or three feet deep, with an ox-team drawing a wagon, filled with their worldly goods, and on top of these were three wenches, and a perfect swarm of ebony children. When they reached the bank of the river the oxen refused to go down into the water, and whipping and coaxing were of no avail. The black figures kept their places, waiting the better mood of their cattle. But suddenly the angry rattle of musketry in the woods near by, suggested, even to their obtuse intellects, that they should not stand upon the order of their going, but go at once. Quick as thought those black mother siezed [sic] their youngest children, and, followed by the others sprung to the ground, looking, in their descent, like fragments of night, dropping from the sky, and dashed through the water. While some of the details differ from those in the image, and though he likely refers to another family in passage, Gates’s account adds a measure of humanity (and drama) to the passage of slaves at Tinpot Ford. Our thanks to Edward Alexander for bringing this account to our attention.